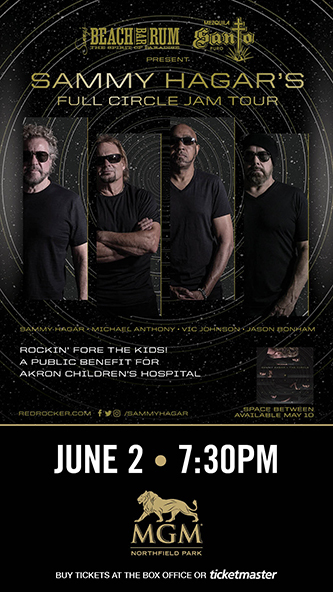 LOPen Charity Events and the Mawaka Foundation are both pleased to announce Sammy Hagar will headline this year’s “Rockin’ FORE the Kids” concert on Sunday, June 2, 2019 at the MGM Northfield Park (Hard Rock Rocksino) in Northfield, Ohio. Special guests Jim Peterik and the Ides of March will join Hagar during the event supporting The Akron Children’s Hospital Showers Family Center for Childhood Cancer and Blood Disorders. For almost forty years, Sammy Hagar has been one of rock music’s most dynamic and prolific artists. From breaking into the industry with the seminal hard rock band Montrose to his multiplatinum solo career to his ride as the front man of Van Halen, the “Red Rocker” has set the tone for some of the greatest rock anthems ever written with songs like “I Can’t Drive 55,” “Right Now,” and “Why Can’t This Be Love.” He’s also earned the highest respect of the music industry with a Grammy Award and induction into the Rock and Roll Hall of Fame alongside Van Halen. Pre-sale tickets for the event will go on sale Thursday, March 14, 2019 at 10 a.m. with a special code. The public sale begins Friday, March 15, 2019 at 10 a.m. VIP tickets are $250 and can only be purchased through LOPen and Mawaka sites. VIP tickets include open bar, food, VIP section and entrance to pre-party festivities at Rocksino. Reserved seats can be purchased through those sites and Ticketmaster. Prices range from $109.50 to $179.50. “Every year we’ve been fortunate to have major musical acts, sports figures and chefs help us raise money for the children and families who benefit from the services of Akron Children’s Hospital,” added Lopez. Past performers include Steven Tyler, Sheryl Crow, Rascal Flatts and Eddie Money. Confirmed attendees at this year’s event are Jim McMahon, Bret Saberhagen, Larry Johnson, Ted DiBiase, Jr. and Ray “Boom Boom” Mancini.